Used these capsules because I was having issues with dry eyes and taking 2 daily took care of the dryness. Since I no longer have a gall bladder the fish oil Omegas are no longer tolerated. But the emulsified Omegas are easily digested. I recommend them often. 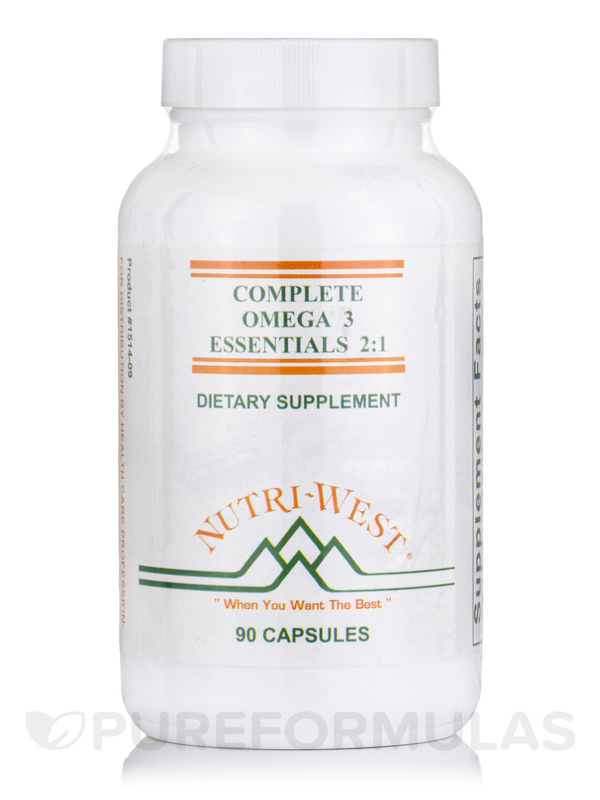 Nutri West’s Complete Omega-3 Essentials (Adult Formula) is a powerful and effective source of extremely valuable omega-3 fatty acids. The substantial health benefits of these fatty acids have become well known in recent years. However‚ the average person may not be completely sure about what exactly they do. Omega-3 fatty acids are a type of polyunsaturated fat that is found most frequently within marine and plant oils; seafood is the most common source. Polyunsaturated fatty acids are unique due to the amount of hydrogen contained at the molecular level. Unlike excessive saturated fats‚ this type of lipid is good for the body. The omega-3 fatty acids found in fish oil are special because they’ve been shown to lower your risk of heart attacks‚ as well as decreasing your likelihood of suffering from other consequences of cardiovascular disease. High levels of omega-3s in the blood also appear to help prevent diseases such as breast cancer. The most famous effect of omega-3s is their potentially huge influence on brain function. The components of Omega-3 are docosahexaenoic acid (DHA) and eicosapentaenoic acid (EPA). An ideal fish oil supplement will contain both. Fortunately‚ the adult formula of Complete Omega-3 Essentials provides the powerful benefits shown by both of these miraculous fatty acids. 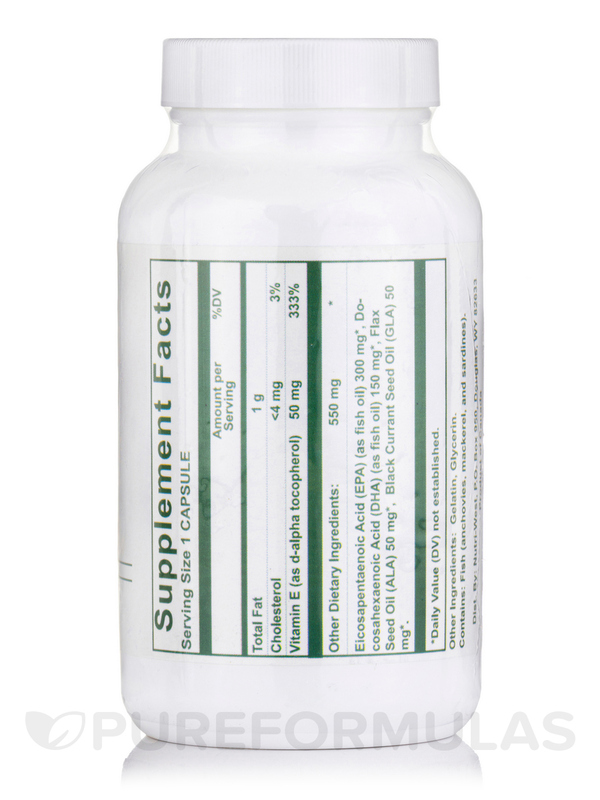 This supplement also uses the most powerful and effective boost of nutrients to give you effective support for relief from inflammation‚ chronic pain‚ depression‚ and osteoarthritis; at the same time‚ it promotes a healthy immune system. 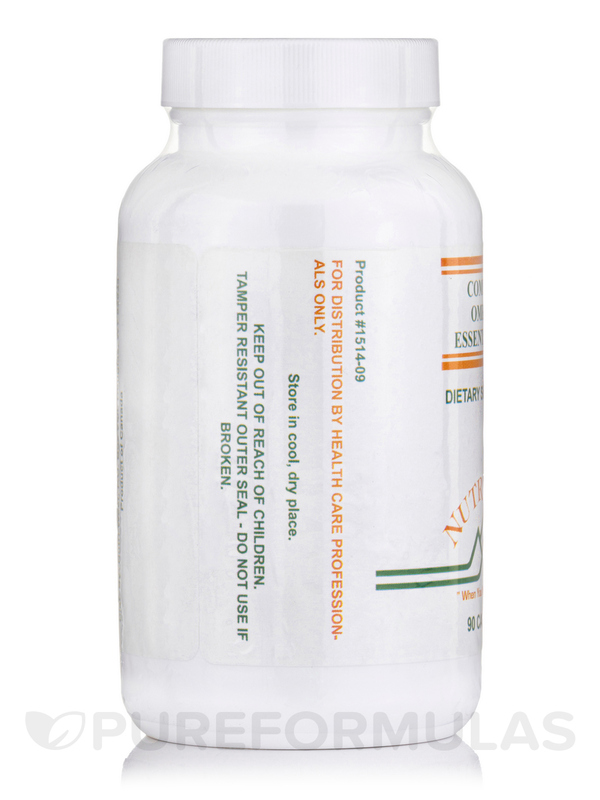 In addition‚ Complete Omega-3 Essentials (Adult formula) provides much needed support and maintenance for the kidneys and cardiovascular system. Finally‚ it helps your body regulate its levels of cholesterol and triglycerides. 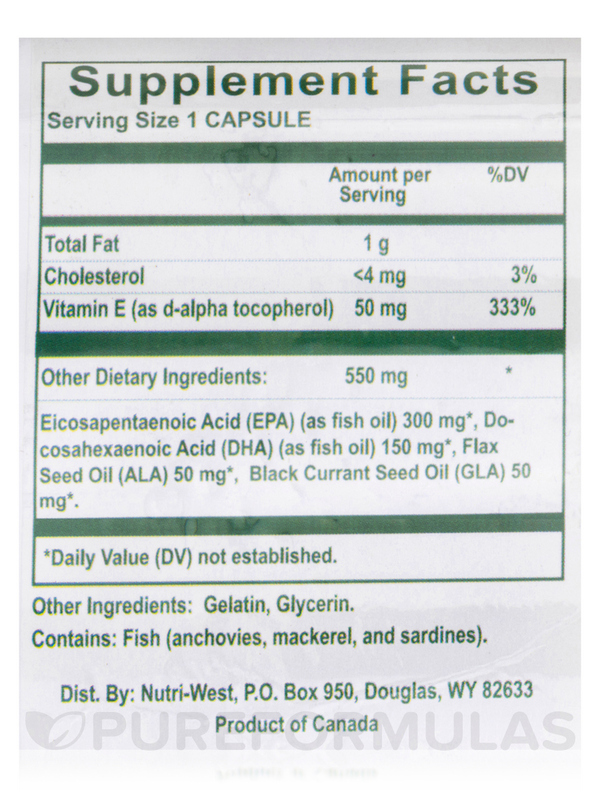 Proprietary blend of: Eicosapentaenoic Acid (EPA) (as fish oil) 300 mg*‚ Docosahexaenoic Acid (DHA) (as fish oil) 150 mg*‚ Flash Seed Oil (ALA) 50 mg*‚ Black Currant Seed Oil (GLA) 50 mg*. Contains: Fish (anchovies‚ mackarel‚ and sardines). **Information on fat and cholesterol content is provided for individuals who‚ on the advice of their physicians‚ are modifying total dietary intake of fat and cholesterol. Keep out reach of children. 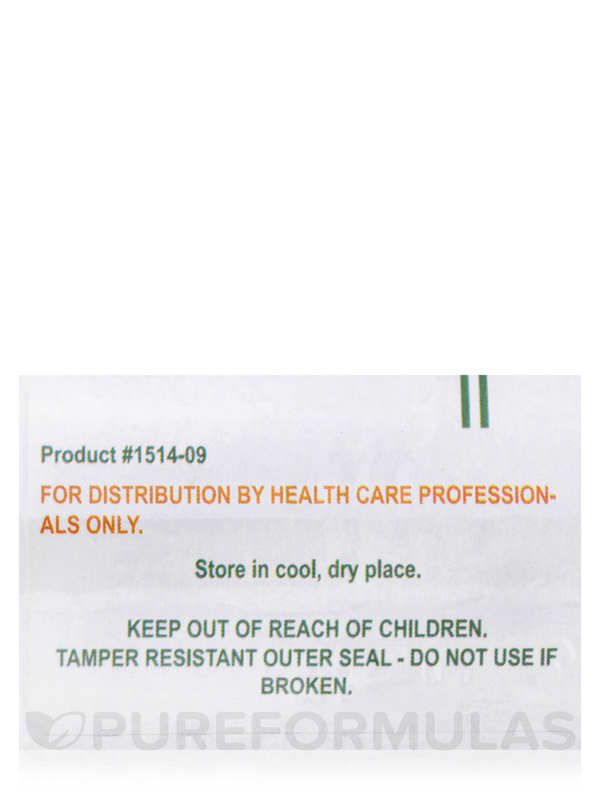 Tamper resistant outer seal do not use if broken. Fish oil can thin the blood (usually considered a benefit for heart support) and should not be used in blood clotting disorders or in combination with blood thinning drugs. We all need omegas. Complete Omega 3 Essentials by Nutri West is a good product to use. I was taking Nutri West liquid Omega-3 for a few months and finally couldn't stand the taste any longer (it's really not that bad, just a personal thing.) 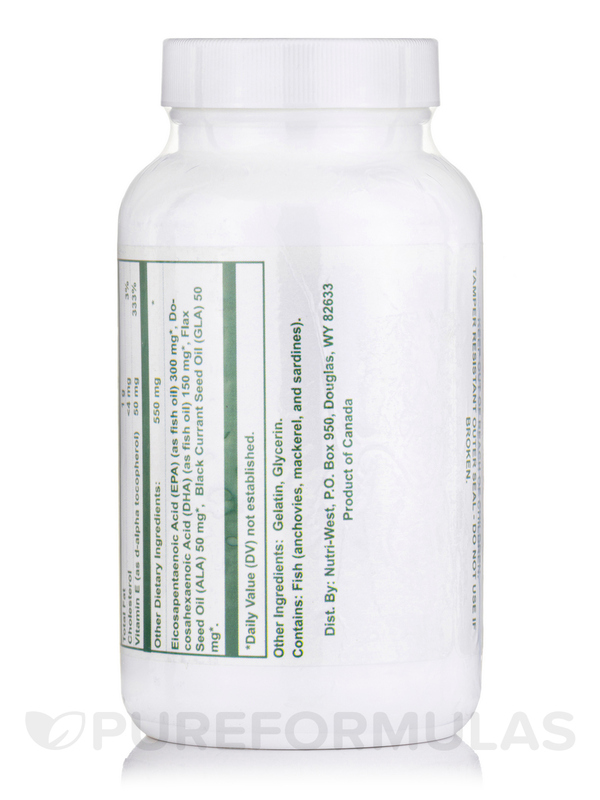 Complete Omega-3 Essentials by Nutri West capsules are completely tasteless, easy to swallow, and very convenient. My package arrived sooner than anticipated and the packaging was great. I'm very happy with my purchase. Tasteless, easy to swallow, high quality! Restores moisture to your body. I love Complete Omega-3 Essentials. Complete Omega-3 Essentials by Nutri West helps to protect from hair loss. Do these ever expire? I found a full bottle from 2008 and would love to take them. Please advise. Hello, thank you for contacting PureFormulas. These bottles have manufactured dates which are good for about 3 years. If you would like you can contact the manufacturer of the product to verify.